December 2018 RevPAR was flat compared to December 2017, and for the year RevPAR was up in all four major California markets. Occupancy declined in 16 of the Top 25 U.S. Markets, ADR declined in 8 and RevPAR declined in 11. Again, please remember the lodging industry follows (not leads) the economy. 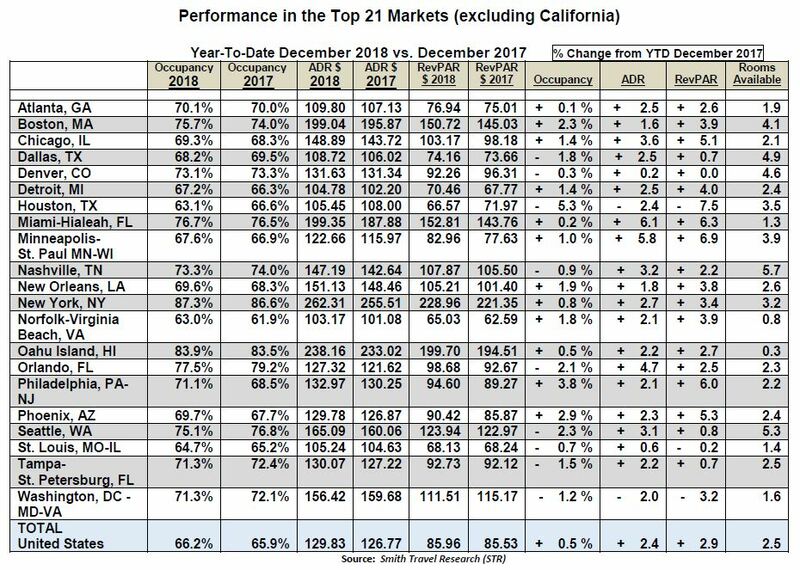 The largest ADR percentage increase for the month of December 2018 was San Diego up 13.2%, followed by Seattle up 6.0%. Occupancy declined in 12 (almost half) of the Top 25 U.S. Markets, ADR declined in 2, and RevPAR declined in 3 of the Top 25 U.S. Markets. Once again, the highest Occupancy, ADR and RevPAR for 2018 was New York at 87.3%, $262.31 and $228.96, respectively. The second highest Occupancy, the third highest ADR and the second highest RevPAR for 2018 was Oahu at 83.9%, $238.16 and $199.70, respectively. The third highest Occupancy, and the second highest ADR and third highest RevPAR for 2018 was San Francisco at 81.9%, $241.33 and $197.72, respectively. The largest percentage increase in Occupancy for 2018 was Philadelphia up 3.8%, followed by Phoenix up 2.9% and Boston up 2.3%. The largest percentage increase in ADR for 2018 was Miami up 6.1% followed by Minneapolis up 5.8%. The largest percentage increase in RevPAR for 2018 was Minneapolis up 6.9% followed by Miami up 6.3%. New product continued to open into the Top 25 U.S. Markets with 9 of the Top 25 U.S. Markets having increases in supply for 2018 in excess of 3%, and 8 of the Top 25 U.S. Markets up between two and three percent. Both Nashville, and Seattle had an increase in supply of 5.0% or more. Also, please remember that there are always a number of sub-hotel markets (part of the Top 25 U.S. Markets) in the United States that are performing above or below their SMSA. RevPAR for the Top 25 U.S. Markets was up 0.3%. RevPAR for the Top 25 U.S. Markets was up 2.5%. For the total United States, the year 2018 saw a small percentage increase in occupancy of + 0.05% but a higher increase in average daily rate of + 2.4%, reflecting the pricing power of the market. Washington, D.C. was down 3.2%.